Here in southern New Jersey, the light has started to grow a bit each day since the Winter Solstice, though the Arctic air has swept down upon us and looks to stay for another week or so, with the winter months still to come. The view into the back yard during last week's snow. Note that the patio closest to the house has been torn up in advance of construction of my new art studio. It's no longer snowy here, but it's so cold that I've taken to wearing fingerless gloves much of the day and drinking lots of hot tea to keep warm. We have heat, of course, but I don't see the need for us to crank it super high, and cold manages to seep in through the slab, I suppose. 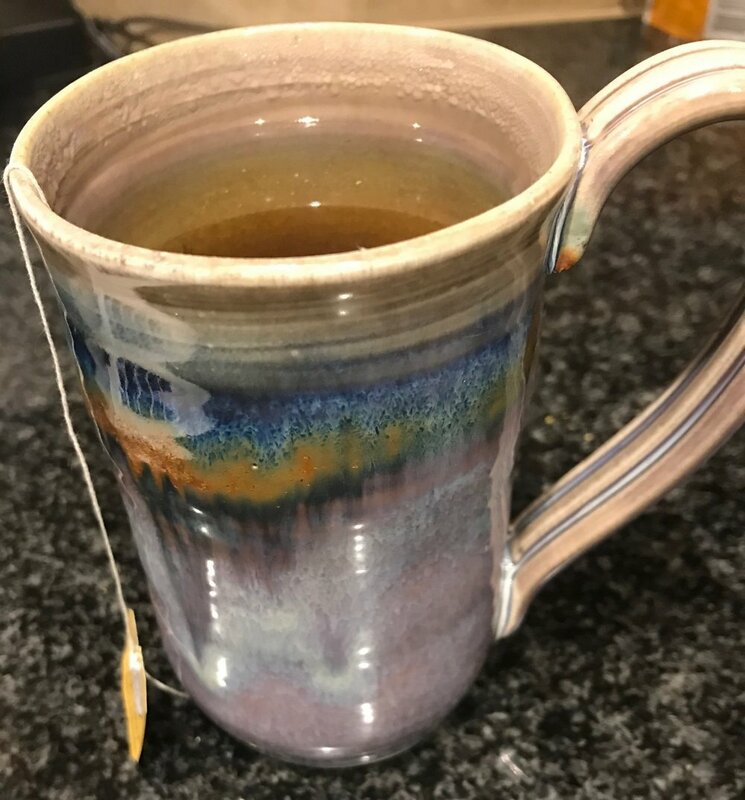 I am loving this beautiful mug, which was a gift from my older daughter. I have responded to the cold in my art as you might expect: by using warm and/or bright colors. I recently completed my Buddha painting, as you can see below, and have started working on some tambourines (art that makes noise!) and a large canvas full of brightness. Acrylic paints and glazes on 24" square canvas. Acrylic paints and inks on 24"x36" canvas. Construction on our addition is likely to occur in January, once this cold snap breaks. Our permits have been issued, and we are excited to get underway, though I confess to dreading the noise and commotion that is sure to accompany it. But it will be a delight to have a designated studio space, and to allow us an uncluttered living room. This week, I've been working on business planning for 2018. It includes creating some new pieces for Valentine's Day, and hopes for several different in-person sorts of sales events in addition to my website. And now, there is nothing left for me to do but to wish you and yours a happy, healthy, and peaceful New Year.